GARDAÍ HAVE SAID a fire in Dublin which let to the hospitalisation of four people is being treated as suspicious. 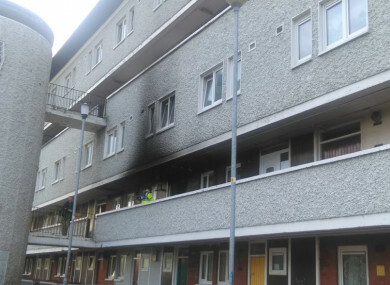 The fire occurred at a flat at Tyrone Place, Inchicore at around 11pm last night. The four people in the flat at the time, a woman and three children, were all taken to hospital. The woman, aged in her 30s, is in a critical condition in St James’s Hospital. An eight-year-old boy and a 13-year-old boy were taken to Crumlin Children’s Hospital, where the eight-year-old is described as being in a critical condition. A seven-year-old girl was taken to Temple Street Children’s University Hospital for treatment. Five Dublin Fire Brigade engines and five ambulances attended the fire. The scene has been preserved and a technical examination is ongoing. Locals described being woken at around 11.15pm last night by neighbours. Email “Fire which led to hospitalisation of woman and three children being treated as suspicious ”. Feedback on “Fire which led to hospitalisation of woman and three children being treated as suspicious ”.